Intro money course needed at the Fed! Putting aside these special factors, most US business cycles are a pretty simple phenomenon. Because of excessively tight money, NGDP growth slows relative to what was expected when labor contracts were signed. Because hourly nominal wage growth is very slow to adjust, a sharp slowdown in NGDP growth raises the ratio of W/NGDP, which leads to fewer hours worked and less output. First, based on the countries analyzed, there appears to be a strong negative correlation between growth rates and the severity of the recent crisis. This result appears to generalize to other industrialized countries as well. After adding Italy, Spain, and Japan to the analysis, the correlation between pre-crisis growth rates and the 2012 output gap was –0.79. Second, the experiences of the United Kingdom, France, and Germany suggest that monetary policy may not have been a main driver of the recovery. Both France and Germany belong to the euro zone and, as such, share a common monetary policy. However, as noted, output contracted persistently in France and only temporarily in Germany. On the other hand, although the United Kingdom has allowed its inflation rate to increase well above its target since mid-2009, it is nevertheless experiencing stalled growth similar to that of France. He´s partly right to say “monetary policy has not been a main driver of the recovery” but that´s mostly because monetary policy almost everywhere has been tight! To say that France and Germany share a common monetary policy is to say that monetary policy is interest rate policy, a common but ‘deadly’ mistake! 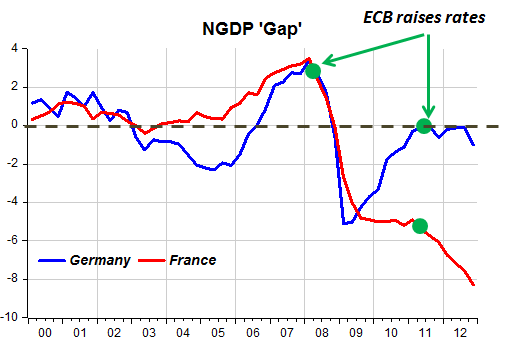 The first chart compares the NGDP ‘Gap’ of Germany and France. Before the crisis it appears monetary policy was broadly similar in both countries but that´s absolutely not true afterwards. 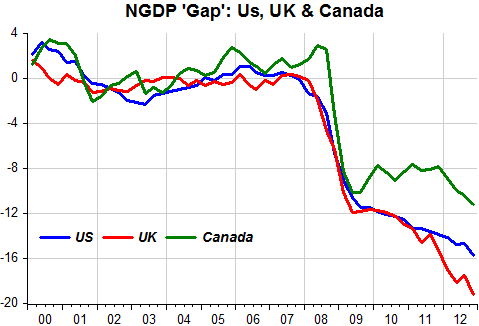 The next chart compares the ‘Gap’ among the Anglo-Saxons. Monetary policy is less tight (albeit ‘tightening’) in Canada while UK money tightness is ‘choking’. In the US, despite QE´s and more recent ‘thresholds’, money is still ‘too tight’.